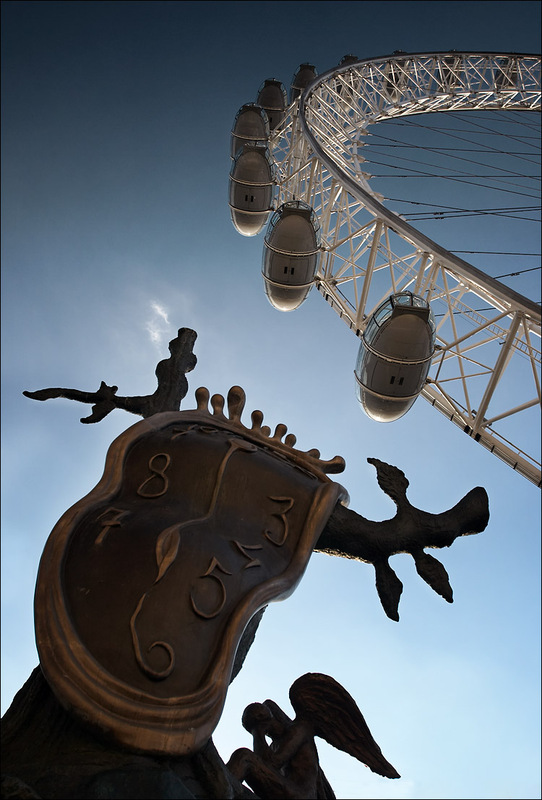 Salvador Dali's "The Persistence of Memory" sculpture at London Eye as photographed by Sam Javanrouh. — Abraham Lincoln in a speech delivered at the first Republican Party State Convention of Illinois (Bloomington, Illinois: May 29, 1856). Transcribed from notes and reconstructed from memory by Henry Clay Whitney (1896). Published as “Lincoln’s Lost Speech” in McClure’s Magazine, Volume 7, Number 4, (New York: S. S. McClure Company, September 1896), p. 324. "Be not deceived. Revolutions do not go backward." My belief is that, after Mr. Lincoln cooled down, he was rather pleased that his speech had not been reported, as it was too radical in expression on the slavery question for the digestion of central and southern Illinois at that time, and that he preferred to let it stand as a remembrance in the minds of his audience. But be that as it may, the effect of it was such on his hearers that he bounded to the leadership of the new Republican party of Illinois, and no man afterwards ever thought of disputing that position with him. On that occasion he planted the seed which germinated into a Presidential candidacy and that gave him the nomination over [William H.] Seward at the Chicago convention of 1860, which placed him in the Presidential chair, there to complete his predestined work of destroying slavery and making freedom universal, but yielding his life as a sacrifice for the glorious deeds. — Joseph Medill in a letter solicited by McClure’s Magazine Editor Ida M. Tarbell confirming the veracity of H. C. Whitney’s transcription of Lincoln’s speech (Chicago, Illinois: May 15, 1896). Published in McClure’s Magazine, Volume 7, Number 4, (New York: S. S. McClure Company, September 1896), p. 322. "My belief is that, after Mr. Lincoln cooled down"
[Ida M.] Tarbell’s weakness, as with other biographers who specialized in reminiscences, lay in her credulity. She was too willing to believe good stories… She…put her authority behind Whitney’s reconstruction of Lincoln’s so-called Lost Speech of 1856. This speech in Bloomington at the birth of the Republican party in Illinois had a legendary reputation. Lincoln spoke “like a giant inspired.” So powerful was his oratory that the reporters, as if hypnotized, laid down their pencils, and when it was over no one could recall what had been said. They simply reported the fact of the speech to their newspapers. Whitney had heard the speech and coolly taken notes from which he now, forty years later, reconstructed it. He sent his handiwork to Joseph Medill of the Chicago Tribune, who had been one of the enthralled reporters, and Medill vouched for its closeness to the original. Tarbell, who had interviewed Medill in Chicago, was carried away by the discovery. She wrote a newspaper article about it in June 1896, and “Lincoln’s Lost Speech” appeared in McClure’s some months later. In its contents the speech resembled others Lincoln made during these years. It may be identified by the peroration as Whitney gave it: “We will say to the Southern disunionists, we won’t go out of the Union, and you shan’t! !” Many knowledgeable persons greeted Whitney’s version of the Lost Speech with skepticism. [John George] Nicolay thought it devoid of Lincoln’s style and pronounced it a forgery. Robert Lincoln concurred. A generation later the Lincoln scholar Paul M. Angle, while regretting the embarrassment to Ida Tarbell, exposed it as the “fabrication” of a scamp. — Merrill D. Peterson in Lincoln in American Memory, (New York: Oxford University Press, 1995), p. 154. Posted on behalf of Abraham Lincoln, Henry Clay Whitney, Joseph Medill and Merrill D. Peterson on Friday, June 18th, 2010 under Misattributions, Quotations.